Youth Soccer Coaching: It’s not all about winning. When it comes to sports, everyone wants to win. Winning is fun. Winning feels great. Winning seems like the whole point of sports. This is all perfectly natural. Sports by definition are a competition. However, there’s a much bigger picture to consider when coaching youth soccer teams- especially at the younger levels. Player development should be prioritized over winning. Our indoor leagues provide a great opportunity for young players to continue to develop their skills over the winter months. While everyone enjoys winning, placing too much of an emphasis on winning at the younger ages can actually hinder player development and limit their chances of winning more games at higher levels. This is not to say that you shouldn’t coach to win- you should. However, when making coaching decisions, the bigger picture should be prioritized over the immediate result of an individual game. Coaching an ultra defensive style with most of your players standing directly in front of your goal. While this could be an effective strategy for grinding out a result, it does not promote the development of well rounded soccer players with the necessary ball skills to compete at higher levels. Coaching super direct, kick-and-run soccer. In the short term, you may see positive results, by continuously “booting” the ball forward to your fastest, most athletic players, but this strategy excludes most of your team from developing the passing and receiving skills needed to compete at higher levels. Putting too much pressure on the players to win. You can and should try to coach your team to win, but putting too much pressure on young players will produce nervous players who are afraid to make mistakes or players could quit the sport early because it’s no longer fun. The focus should be more on the learning process and developing players in the long run. It’s possible to play very well and still lose and it’s possible to play poorly and still win. Rotating players’ positions promotes the development of well-rounded players who understand the game as a whole. Players physically develop at different rates- the tall, athletic 10 year old who may currently seem like an imposing central defender right now, could actually be one of the smaller players by the time he’s in his teens. Coaching an attacking style based on possession: Playing an offensive style of play based on keeping possession and quick movement of the ball promotes the development of the entire team and prepares players to play at higher levels where “kick-and-run” is a less effective strategy. While possession is very important, players should also be encouraged to take chances and gain an attacking advantage by dribbling past opponents. Playing out of the back: Goalkeepers and defenders should also be encouraged to keep possession and pass the ball forward in a controlled manner- keeping the ball on the ground when possible. In the context of a single game, this can be a risky strategy with less skilled players, but promotes the development of intelligent, skilled players in the long-run. Indoor leagues provide a great platform for players to develop their skills in a fast paced environment where skill and control need to be emphasized over athleticism power. 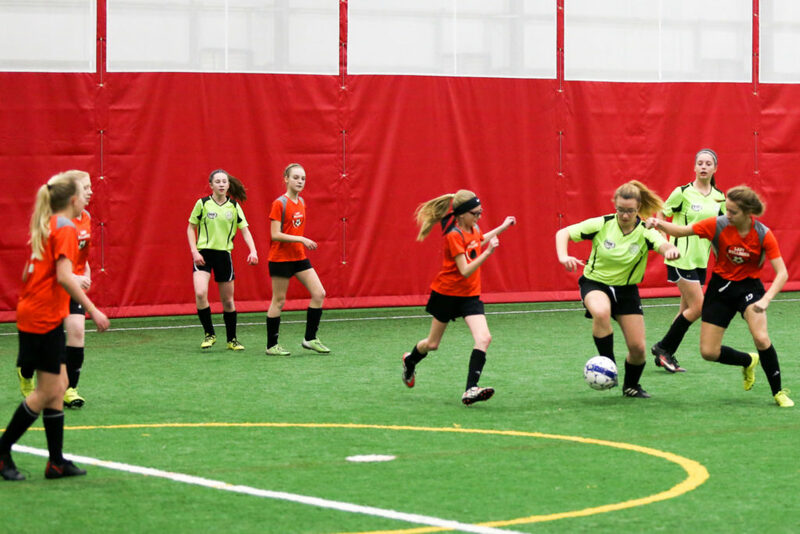 Even if your team places a strong emphasis on winning, the indoor game forces teams to play a more controlled game, where every player is expected to contribute in both attack and defense. There’s nowhere to hide when there’s only 6 players on the field and players must adapt to the nature of the indoor game to be successful. Small sided games are at the heart of player development and it’s no coincidence that virtually every international soccer federation is placing a strong emphasis on small sided games at the youth levels. At the end of a player’s soccer career, whether it ends after high school, college, or even after playing at the professional level, it’s doubtful they’ll look back and reminisce on their “glory days” of winning a U12 indoor championship at the Liberty Arena. However, the players who go on to play at those levels, will certainly appreciate the valuable lessons learned from playing small sided games at places like the Liberty Arena. There’s also one other very important thing to remember: Indoor soccer is a lot of fun! Scheibeler is a 2007 graduate of Loyalsock Township High School where he was an All-State selection as a midfield player. He played college soccer at both Elizabethtown College (NCAA DivIII) and Lock Haven University (NCAA DivII). Scheibeler brings a vast amount of soccer experience to the Arena including 10+ years of experience coaching soccer at both the youth and college levels. Scheibeler has previously coached with the Soccer Training Network (STN) and served as the head coach of both the Loyalsock Boys and Montoursville Girls High School programs, winning the Heartland Conference I and District IV Championship with Montoursville in 2013. In 2017, he completed his third season as assistant coach with the Penn College Men’s Soccer program helping lead them to their first ever NEAC playoff appearance and first ever semi-final appearance.